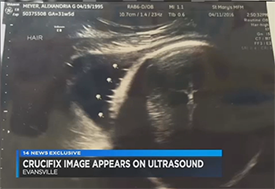 It wasn’t until Aley Meyer of Evansville, Indiana, took the ultrasound picture of her soon-to-be-born boy to her baby shower that someone noticed something in the picture besides the baby. There, towards the right side is an image that appears to show Jesus on the cross. “We took a picture of it and blew it up on my phone to get a closer look and it is so much detail. You can see the hair and his legs crossed and everything,” Aley said. She posted it on Facebook and it went viral. Aley thinks the ultrasound is a good omen. She has Crohn’s disease and feels it means baby Easton won’t. Meanwhile her grandmother bought a crucifix which Aley plans on hanging on the baby’s room. And to think, there’s a perfectly nice crucifix on the ultrasound they could frame and hang there.